It was a particularly hot afternoon, so I gazed at the icy mug of beer before me with a sense of anticipation. I still had the idea — right or wrong — that draft beer should be crowned with a head of foam, albeit not too thickly. Lacking a head, this beer seemed like a shirt without a collar. That was my first reservation. Viewing the beer against the light, I saw that it had a small number of tiny air bubbles. I thought that a strong dose of bubbles, of a certain size, was required to prepare the palate to savor the brew, and from that arose my second reservation. Nevertheless, as I said, the day was quite hot, so I took a swallow of that conveniently iced draft beer. At that time I had not yet fallen into the misfortune of having to avoid cold drinks. Indeed, I liked everything that was cool: above all, summer breezes, fresh temperatures, and icy beers. Thus I sought to quench my thirst with the contents of that frosty mug. The beer tasted good enough, but lacking a head of foam and being somewhat flat, it seemed rather devoid of life. There could be no discourse with that beer, which was as monotonous as idle gossip. In that humble beer, I saw the possibility of its being greater than it was, and this possibility spoke to me of God. A few moments after I had drained the glass — not withstanding the defects that had given rise to my earlier reservations — I noticed a flavor tastier than the beer itself lingering on my palate, which reconciled me to the brew. It was, of course, the beer’s after-taste — something like that feeling one gets after having reflected on an idea and reached a conclusion about it. 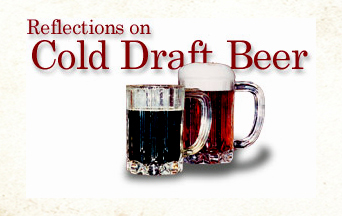 Nothing, not even ice cream, bears the charm of glacial cold better than a draft beer. Between beer and cold there is a natural marriage, which highlights beer’s character. 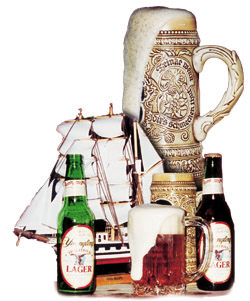 Of course, like everything in this world, that beer was but a rough sketch of a perfect ideal. Perfection implies two characteristics: first, being devoid of any defects; second, having qualities that are invariably elevated to the maximum degree possible. Frankly, I could not have appreciated that beer had I not been able to picture the perfect draft beer. At the same time, having imagined the perfect draft beer, I knew I wasn’t drinking anything but a common beer. Nonetheless, it led me to contemplate its possible perfection — and that contemplation is the joy of my life. Without a doubt, the color of beer is beautiful, though I wish mine had been endowed with a more consistent golden hue. Be that as it may, beer is an attractive domicile for light. Light enters the beer and remains within it, becoming more beautiful than light in water. That is saying a great deal, since from a certain perspective water is an ideal abode for light. A life lived in such reflections is utterly enjoyable. A child studying a glass of beer can entertain himself much better than if he were gazing idly out a window. A contemplated beer speaks more eloquently than a neglected window. We must accustom our spirits to savoring things in this manner. The man who loves beer and interprets it solely in terms of itself winds up a drunk, but the man who savors not simply a cold draft beer but the ascent to the marvelous to which its contemplation leads will know the nobler and more lasting joys of moderation. The preceding article is taken from an informal lecture Professor Plinio Corrêa de Oliveira gave on January 24, 1995. It has been translated and adapted for publication without his revision. –Ed. This entry was posted in Catholic Perspective, Plinio Corrêa de Oliveira and tagged after-taste, beer, brew, cold, contemplate, contemplation, draft beer, God, head of foam, icy beer, icy mug, idea, Light, reflect, reflections by Plinio Corrêa de Oliveira. Bookmark the permalink.